← STAGNATION…One Word, Express In One Hundred Words In One Hundred Days. HUSBAND…One Word, Express In One Hundred Words In One Hundred Days. Husband Is Not Your Mate But Your Lord. Ask Sarah If You Are In Doubt. She Called Abraham My Lord. 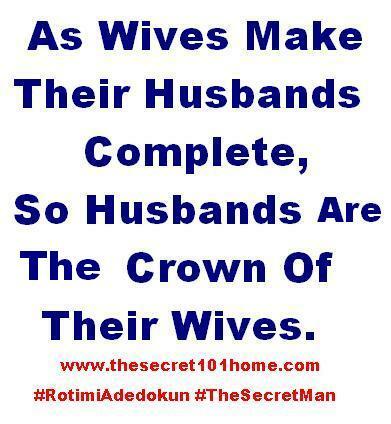 As Wives Make Their Husbands Complete So Husbands Is The Crown Of Their Wives. Husband Is Not Your Boss—If You Are Fearful You Won’t Fulfill Your Purpose In His Life. Husband Is Not Business Partner—Don’t Think Equality In Dealings. You Won’t Get The Best Of Him. Husband Is Not Your Boyfriend—You Cannot Dictate To Him. But Your Advice Is Welcome. Husband Is Not You Mate—You Are A Mate To Any Other Men But Not Your Husband. This entry was posted in The Secret, Vitamin Of The Mind, You! and tagged Bishop David Oyedepo, Good Family, How To Be A Good Wife, How To Build A Good Life, Husband, Husband And WIfe, Jim Rohn On Husband, Pastor E A Adeboye a Good Husband, Rotimi Adedokun On Husband, The Secret Of Good Family. Bookmark the permalink.